People living with ALS can maintain independence longer and enjoy improved quality of life when provided with options for symptom management, assistive technology, adaptive equipment, education, care services, and emotional support. The ALS Association's certified centers and clinics follow a multidisciplinary care model that brings together a team of health and social care professionals with expertise in addressing the various and ever-changing needs of people living with ALS and their families. 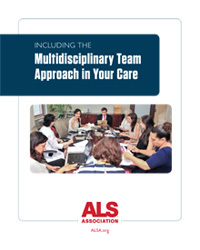 This booklet will provide a helpful overview of the multidisciplinary team approach, what one can expect during a typical clinic visit, as well as additional options for care and support from providers outside of the core care team. This resource guide is the result of many years of clinical social work practice and research with families, children, and youths affected by neurological illness.